Does the Middle East need to chill out and party? The U.S. State Department seemed to think so. Update #2: A new twist in the story emerges! Salon is reporting that Andrew W.K. was indeed invited to be a musical ambassador for the U.S. State Department, but after further examination his invitation has since been retracted. A government spokesperson called the original invitation "a mistake and not appropriate." What a shame. Update #1: New York news blog Brokelyn is now reporting that Andrew W.K. 's press release was a hoax, and that after speaking with an unnamed member of the State Department's press team, the rocker will not be making a rounds overseas. The government agency hasn't officially confirmed or denied the news yet, so there may still be hope, but for now it looks like this one was just too good to be true. 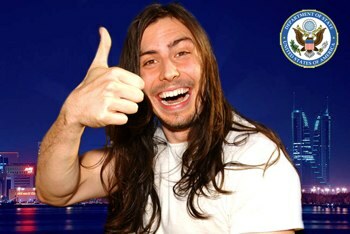 Original Story: Noted musician and all-around partier Andrew Wilkes-Krier - better known as Andrew W.K. - has a new gig, but it's probably not what you'd expect. The performer has been named Cultural Ambassador to the Middle East by the U.S. State Department. I'll give you a moment to re-read that and let it sink in. "This is a tremendous invitation. I'm very thankful to the Department of State for giving me the opportunity to visit a place I've never been before," the artist notes in a statement on his official site. "And I feel very privileged and humbled by the chance to represent the United States of America and show the good people of Bahrain the power of positive partying. I can hardly wait for this adventure!" The statement also likens W.K. 's impending journey to that of U.S. Jazz musicians who traveled to other countries many years back to help spread a positive image of America. The performer will begin touring schools and performing for the people of the Middle East at musical venues in December, though official dates and locations are being withheld for security reasons.